The largest public transit project in the Bay Area is rapidly moving forward, but there is one major hiccup for Phase II of BART's extension to the South Bay. Phase I is fully funded and should be completed no later than 2018, running BART mass transit trains to both Milpitas and Berryessa. Phase II--which includes stations at Alum Rock, Downtown San Jose, Diridon, and Santa Clara--is now at risk of losing a huge chunk of Federal Funding. Timing is absolutely critical here. The project needs to enter the Federal New Starts Program by the end of 2014, or $1.1 billion of funding could be cut from the project, putting the whole phase at risk. A four station Phase II BART extension will cost $4.7 billion. That breaks down into $1.1 billion from the Federal New Starts Program, $1.4 billion from Measure A, and a whopping $3 billion is unaccounted for. This puts the project at a high risk of being rejected by the Federal New Starts Program and we would likely need new substantial taxes to fund the $3 billion gap. So here is the new proposal to get things off the ground and secure most of the funding within the next two months. Let's only build two station in Phase II: Downtown San Jose and Diridon. These will be by far the most utilized stations in the South Bay extension and would result in substantially reducing the cost of Phase II. The total cost would now become $3.4 billion, $1.1 billion from the Federal New Starts Program, $1.4 billion from Measure A, and a $1.7 billion gap. Since more than 50% of the project would be funded, it would greatly improve our chances of getting federal funding. Personally, while I would love to have the full four stations now... I would gladly take these two over no extension at all (or one delayed to 2030). 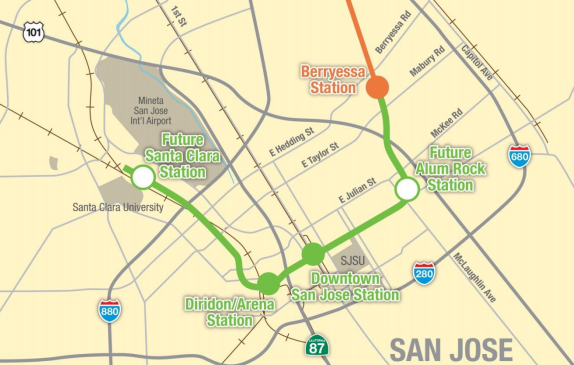 The Alum Rock and Santa Clara stations could be built in a future Phase III. In fact, my dream scenario for Phase III would be these two stations plus a further extension up north to Levi's Stadium/Great America, Mountain View, and Palo Alto. We have to start somewhere. What do you guys think about dropping two stations temporarily in order to ensure BART connects with Silicon Valley's urban core? Skip Santa Clara, there's already Caltrain. Phase III should go to Santa Cruz via the San Carlos/Stevens Creek corridor, Santana Row, Winchester/N. Santa Cruz Ave/Los Gatos, and then over the mountains to Santa Cruz. That would cost $15+ billion. Over the hills? Do it like they did in the East Bay, through the hills! Let BART take over CalTrain. Then we'll kinda have a BART "ring around the Bay." It's too bad BART and Caltrain use completely different tracks, otherwise that would be a nice possibility. Light Rail and Caltrain do use the same tracks, but the problem would be electrification for Light Rail (would need new Light Rail trains using batteries instead of pulling juice from above). Joshua, I think what the other person means is for BART to take over CalTrain administratively. In other words, have BART management also manage CalTrain. I support the idea. But yes, CalTrain should have been made electric as soon as the technology was available. Ah, I would definitely support that too. Having spent significant time in Zurich, it would be great if San Jose could augment BART, Caltrain and eventually HSR with an infrastructure similar to Zurich. http://vimeo.com/108884155 IMO, this type of well integrated system where people can get out and walk or ride their bikes and jump on/off tram at any time is what will attract people to the San Jose core. Density is critical. Why does it seem so expensive to implement this? A billion dollars? We're not freakin' flying a space shuttle to space. Wide gauge track + electrified third rail so BART needs dedicate ROW, plus in this segment they need go underground all the way down Santa Clara St. to Diridon. Agree with 1st poster. Diridon is first priority. Downtown is 2nd priority. All other stations can wait. Economic impact of the delay should be quantifiable, and I believe would be much greater than losing Alum Rock or Santat Clara. Problem is that it will still take forever to get from San Jose to San Francisco. And the same from SF to SJ. But that's to be expected. With the CalTrain baby bullet, it only takes about an hour to get to SF from downtown SJ. About the same as driving (less than driving, during rush hour). This would speed up going to the East Bay. Yeah, but who wants to got to the East Bay? Santa Clara station can be skipped entirely. The only disadvantage to that would be the Earthquakes and the Airport. But once BART gets down to Diridon, then you can still jump on Caltrain to Santa Clara station for Earthquakes and the Airport. Or you could even jump off at Milpitas BART station and take light rail down to Metro station for Earthquakes and Airport. The Five Wounds one is the only one I would regret to have missed, but the most important stations are still Diridon and Downtown. In fact, I didn't even know there was a Five Wounds station in the plan until recently. It just seems like the East Side is always ignored. The East Side needs access to all the same benefits that the rest of the city has. It IS workable. I question the VTA's assessment of the situation. Having a not-quite-downtown station with no parking seems to me to be a big mistake. And not connecting (at least somewhat closely) with the airport is likewise a huge mistake. Who will use (walk to) a 23rd street station? Who will take BART to 23rd St and Santa Clara? That to me is a total waste of money. On October 6th, the VTA unilaterally proposed to the Silicon Valley Rapid Transit Program Working Committee the elimination of the Alum Rock BART station. Your online petition will be submitted to the following parties to request that the VTA Board save the Alum Rock BART station: Valley Transportation Authority, City of San Jose’s Mayor & City Council Members, San Jose City Manager, and the Santa Clara County Board of Supervisors. You cannot "drop two stations temporarily." It's cost-prohibitive to go back and retrofit stations into a functioning system. At a minimum, you would need to rough-in station boxes. And that still costs money. You skip two stations and you've forsaken two stations -- and you've once again forsaken those who use public transit most. Downtown can use one station at Diridon. Building two puts them too close per the FTA's funding guidelines. Unless you build the downtown station just east of City Hall. They should have the Alum Rock station. That is where more low income people who rely heavily on public transportation would benefit the most. Its not fair that East side San Jose always keeps getting short end of the stock when public or city planning happens.it seems that those communities where lower income and people of color live get more marginalized and don't benefit from city development. Diridon station makes sense but the other station should be the Alum Rock/Five Wounds station. It would be next to 101 with plenty of parking. Skip downtown since it's within walking distance of the Diridon station This is just another example of the East side getting the short end of the stick. If other stations can be built in the future why not downtown. My feeling is if Alum Rock doesn't get built on the first phase it will never happen. VTA worked with the community on this station and at the last minute they pull it. It still remember light rail to Eastridge. Is planned funded and at the last minutes funds are switched to other projects. VTA needs to be held accountable to the people. The Alum Rock/28 street station and Dirdon makes the most sense for a phase II. Dirdon is a major transportation hub. But Alum Rock comes with parking, is easily accessible to the heavily congested 101, will serve the east side, which has a large population that relies on public transportation, and it has the most comprehensive long term development plan for office space, retail, and high density housing to be built based on that station going in (as outlined in San Jose's 2040 general plan). I definitely see a strong value for the Five Wounds Station (which no longer will come with parking BTWin any scenario), but there is no way I would pick that over a Downtown station in the middle of the most dense part of all of San Jose. Diridon is a 15-20 min walk from most of Downtown's amenities versus 0-5min for a BART station under Santa Clara Street. So once again East San Jose (28th Street Station) gets the shaft from VTA? Remember Light-Rail to Eastridge? What happened? Instead, light-rail goes to Great Mall to support Milpitas. Wake up!! Folks in the east-side use public transportation! The station on 28th allows for 2,500 parking spaces and is directly off of the 101 freeway. The 28th Street station already got the "shaft" in 2009 when the decision was made to end phase I at Berryessa. Where will all the South County commuters (Gilroy, Morgan Hill, Evergreen...) go that need to get on BART? If the 28th st parking structure/transit station is not done, these commuters will just park anywhere they can (can't blame them) - to get to the 2 existing stations in San Jose. This will severely impact neighborhoods and other existing downtown parking. While the 28th St station is incredibly beneficial for the local neighborhood from an economic and transit perspective - the parking structure is a critical piece of this whole BART to San Jose plan. There needs to be more explanation of what the actual numbers are - it's awfully far to Santa Clara. Separate that from the costs to 28th St.
And ask which parts are underground and which are above ground. Where are the costs overruns. What will VTA BART SV lose by ignoring both disadvantaged communities and community collaboration. Their rankings may actually be hurt more. I agree that a 23rd St under Santa Clara is completely useless. Better to keep 28th Street, Downtown SJ City Hall (not at 1st St) and Diridon station. Forget Santa Clara BART near SCU. People can take CalTrain to that station. IF BART went into the airport then it would be a different story. VTA…Do what you said you were going to do. After planning and promoting and taxing and engaging the community over a ten year period, an altered plan is not acceptable. It is not OK to bypass East San Jose or the natural feeder point for South Valley and East San Jose residents. The 28th Street station is a critical part of the BART plan and to turn around and say maybe later or consider 28th Street as lower priority now is essentially voiding all good will with the public. This has been a very public process that is suddenly turning inward. It poisons the credibility of all the advocates for BART from politicians to business groups. THIS SMELLS LIKE CORRUPTION!!! IS CHUCK REED AND ALL THOSE COUNCIL MEMBERS GAMBLING ON ONE OF THE TOP POKER PRIVATE ROOMS @ THE M8TRIX? Need to relax, the goal is to make this project more likely to happen within our lifetimes versus pushing out the start date indefinitely. This is a false choice that VTA and Joshua are presenting. 2) Disadvantaged communities that have not received adequate service are once again not getting the service that is due them.